I’m a former runner, attempting to make a late impact in the world of cycling, or at the very least see how far I can progress in a new sport. 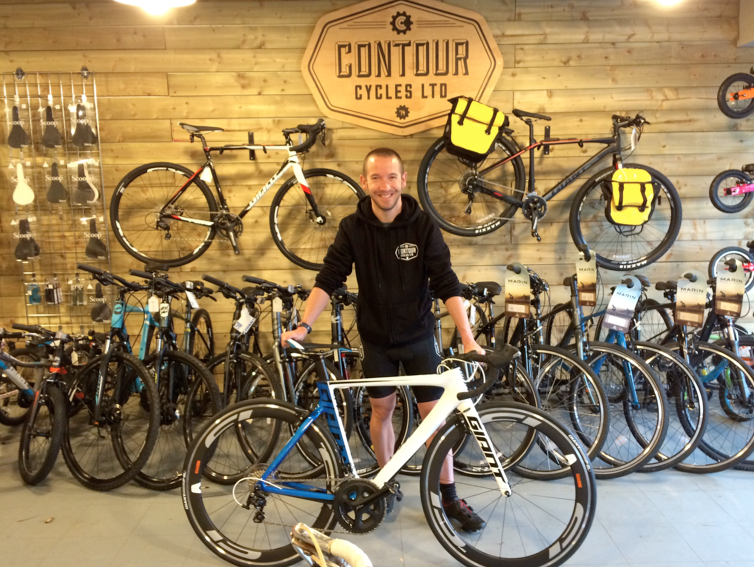 Contour Cycles are going to be supporting me for the 2016 season, and I’m going to be writing about my progress and my observations of cycling in a blog which can be followed through their website. I’ll start will a mini lowdown on my sporting history and a brief summary of my first year of cycling. I started running as a 12 year old in 1990 – yes I’m old!! I was lucky enough to fall in love with a sport which over the years offered me many unique opportunities, which frankly wouldn’t have come about any other way. At 16 years old I gained my first international vest, running for the England Schools team against Scotland, Ireland and Wales. I went on to represent England and Great Britain U20, U23 and Senior team on the track, road and cross country, and was lucky enough as a result to race in a large number of European Countries as well as far flung destinations such as China, Saudi Arabia and Thailand. My experiences as a runner certainly shaped me as a person, and as recently as 2014 I had my last representative race as a runner. During 2013 and 2014 I suffered pain in my hip area when running fast in training or racing, this was eventually diagnosed as a chronic tear in my abdominal wall (sportsman’s hernia) and an operation followed, it was at this time I decided to ‘retire’, explaining to my wife I would buy a bike as I didn’t want to get fat, and having run in excess of 100 miles a week for a large chunk of my adult life this would be a distinct possibility! So post op I started to cycle. I had a small advantage as during my running career I had flirted with Duathlon for the 2008 and 2009 season, being lucky enough to represent the GB elite team at both the world and European champs, and actually having a year on the lowest step of lottery funding. During this I had raced a few CRIT (criterium road races) in order to get my bike handling up to speed and even won a low key race, lifting me from a 4th Category cyclist to 3rd Category. 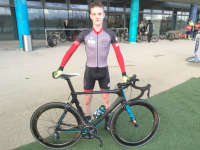 Having started riding in late December 2014 I quickly realised that just keeping fit wouldn’t be enough for me, and to raised eyebrows from my wife I started to plot a return to racing – but this time as a cyclist. To help me get into the racing scene I joined CC ASHWELL, a fantastic club based in North Hertfordshire, my 8 year old daughter was also showing an interest in cycling and we both joined together. A harsh return to racing in March, jumping in at the deep end with a 2/3 CAT crit was an eye opener, as I was lapped early into the event… however, I ploughed on, entering Crit races in venues including the Olympic Park, Milton Keynes, Redbridge (Hog Hill), Solihull and Eelmoor in Hampshire. The more I raced, the fitter I became, and the more my confidence grew, soon I was picking up a point or two and my aim of progressing to CAT 2 cycling seemed to become more achievable. Later in the season my results in races became more consistent and a 2nd places at Eelmore and Hog Hill, followed by a win at Redbridge sealed my 2 nd CAT for 2016. 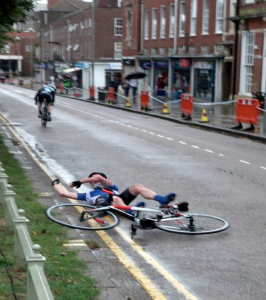 I believe the best way to learn is just to ‘do it’ and see how you get on – this was exemplified by my first race in heavy rain, when having been fortunate enough to race in sunshine all through the year – I now know heavy rain, 120 PSI tyre pressure and technical circuits don’t mix!! It was at this stage that Contour Cycles, whom I’d met and was impressed with when getting an excellent FROG bike for my daughter offered to support me for the 2016, and my dual aims of making the European Police road race team, and chasing 1st CAT status – a big step up from 2nd CAT with 200 points needing to be gained in a season. So for 2016 I’m lucky enough to be riding a Giant propel Advanced pro 2. A beautiful aero bike which should help me when racing CRITS and road races, which I’d like to do more of in 2016.